Wautoma once had a drive-in theater. 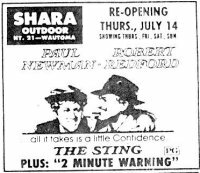 I didn't know that this theater existed until I was researching information on the Oshkosh 44 Outdoor. I ran across the advertisement in the Oshkosh Northwestern from July 1977. The theater must have been closed for a while because of what the ad says. The theater was located on the east side of Wautoma on Highway 21 / 73. There is a Copps grocery store in that location, now. After the theater closed, the screen and equipment were sold and moved to the Great River Outdoor Theater in Prairie du Chien.